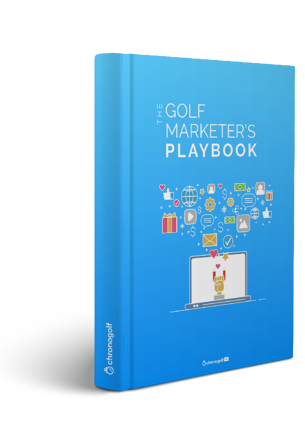 Do your golf marketing strategies take Google into consideration? Are you worried that your website is not showing up when prospectives golfer searches for tee times in your area? Golf operators are noticing that when it comes to search results, online tee time distributors are very good at getting their websites near the top of every golf related query. A lot of courses are battling for real estate on Google, they too want to rank for the keywords golfers typically use to search for tee times in your area. So, between the online tee time aggregators and all the local operators there is a ton of competition to rank higher on Google searches. If you want to rank higher, now is the time to develop golf marketing strategies that will finally get your website ranking better than the competition. Massive tee time distributors usually have a very high search engine ranking since they have such huge websites and invest hundreds of thousands of dollars into search engine optimization (SEO). This means that a search for a round in your area will likely display their website above your course in the search page result. If you partner with the distributor it’s not necessarily a bad thing since your course will still appear on the distributor's website. However, it's always better to rank higher than the distributor you work with so you can encourage online bookings directly on your tee sheet, instead of through an aggregator. Not to mention that a higher search engine rank puts you ahead of the competition. If you're afraid of these fancy terms like SEO don't worry! 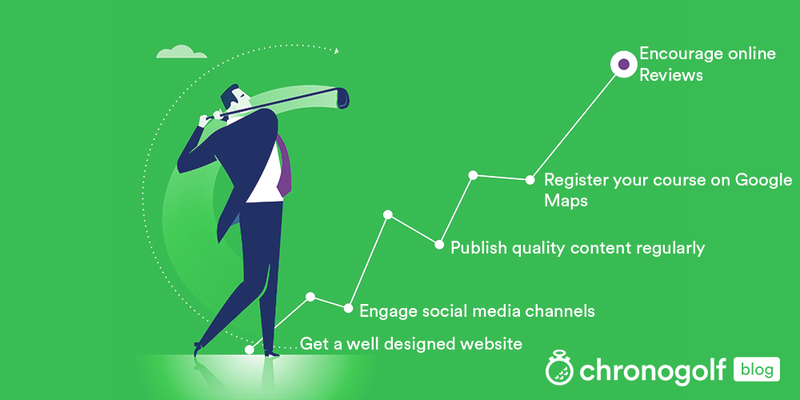 Check our top 6 golf marketing strategies that will get your website ranking higher on Google. Google can tell whether your website is designed according to best practices and standards. If your website does not adhere, you're telling Google that your operation is inferior to other websites that sell tee times online. Use simple web design tools such as Wordpress and you'll be able to ensure that the content on your website adheres to current SEO standards. To improve rankings on Google your golf course needs a blog that publishes posts regularly. By investing in a small golf blog you can engage your audience with content, create a channel for online promotions, and develop a larger following. Blogging tells Google that your website is an important place where golfers can find meaningful information. Proving that your website is a credible source of meaningful content will tell Google's search engine algorithms to put your website in front of more people when they search for green fees in your area. Ask whoever developed your website if they can add a blog page and then recruit your smartest, thought leading employees to write golf related content that will impress your audiences. Even a simple post about upcoming events at the clubhouse or a recap of last week's tournament can do wonders for nurturing your customer relationships, promoting your golf course online, and improving search engine result rankings. Get serious about making content for your audience. Using social media not only puts your course in front of a larger audience, it also improves your search engine results since Google is able to register traffic from social media to your website. Using social media is a further means of proving that your course is a meaningful online community that provides quality information to golfers. Plus, if your making blog content you now have a great new channel to share all of those blog posts you worked so hard on. 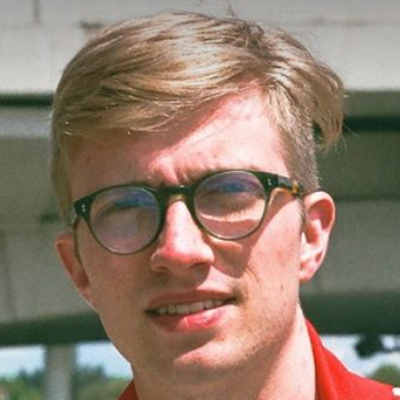 Okay this one's pretty easy. You just have claim the business through Google, chances are they already have your course listed with limited information. All you have to do is prove you are the owner of the business and then provide detailed information about the course, opening hours, and a few pictures. Now your golf course is much more likely to show up when people search for tee times in your area and when you do show up they'll find detailed information about your facility. Take this a step further and make sure your business is registered on Bing, Yahoo, and Facebook too. These golf marketing strategies of increase your footprint on the web and are crucial for making it easier to search for your golf course online and ultimately improve your rank in search results. This one seems pretty obvious but many golf operators are not actively pushing for more online reviews of their facilities. Google can tell if your course is receiving favourable reviews on Yelp and other entertainment websites. These reviews directly determine how Google ranks your course in search queries so it may be time to consider encouraging your customers to review your golf course online. Getting favourable reviews on these websites can get you a ton of visibility and credibility in the eyes of someone searching for a round of golf in your area. A few ways to generate reviews of your operation are to encourage your top 10 most loyal customers to post a review of your operation. You can also put up advertising displays that encourage online reviews around the pro shop and restaurant. Online you can promote reviews from your social media and blog channels. Once you get a few customer reviews on your golf course don't forget to reply to their comments! Paid search is a feature offered by search engines where you can actually pay to show up on the top of the results page for particular queries. This is a huge advantage, because most people usually click on one of the first websites that they see. If done right, this kind of marketing strategy can send high quality potential customers your way. Google and Bing charge for paid search by click, meaning that you'll pay a certain amount every time someone clicks on the link to your page. This may seem scary, especially if your budget is small, but if you set up your paid search campaign properly you can be extremely successful. Google allows you to set a limit on the amount of money that you want to spend per month on paid search, so you won't run up with a bill that is way out of your price range. It's very important to be selective about what you want to rank for. Keep in mind that the purpose of paid search is to drive people to your website so that they will purchase a round or come to your course. You should target very specific keywords that are relevant to your customer base. Pay only for local search terms like "golf courses in Arizona" (or wherever your course is located). If you're going to bid on a broader keyword like "golf courses" make sure that you set a limit to your geographic area. This will ensure that your only paying for traffic to your website for people that are looking for golf courses around you and that you're not wasting money on searches from the other side of the country. Backlinks are incoming hyperlinks from one web page to your website. Backlinks from more trusted websites will make Google trust your website more. Gaining these links is a highly effective golf course marketing strategy that most of your competitors are not taking advantage of. One way to do this is by getting blogs to talk about your course in a "Best Courses in X" article. The first step is to do some research to see if these articles already exist for your area. If they do, see if your course is listed. If it is listed, make sure that there is a link pointing to your website in the section about you. If there is no link, you can send an email to the writer of the blog post to kindly ask them to place that link in their article. If your course is not on the list, you can contact the writer with some info and images on your operation, and ask them if they'll add you to the list. 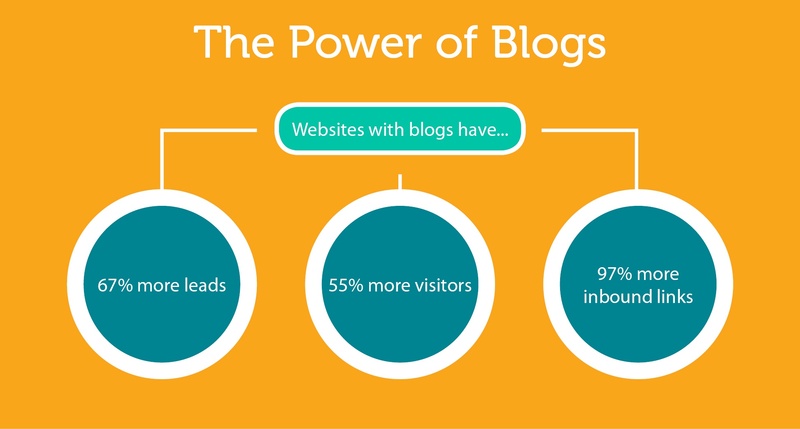 A more creative way to get backlinks is to collaborate with blog writers. If you're a golf manager, then you're definitely a good resource for blog writers to gain information. You can offer to write an article for them about the golf industry, or even to let them conduct an interview with you about what it's like to run a golf course. You should also check if any companies that you make purchases from have blogs or customer testimonials sections. These companies are usually looking for customers who are willing to say good things about them or provide insight, and would be happy to include a backlink in exchange. Your head pro knows a lot about the game of golf, getting them to write blog posts or make videos about golf fundamentals can drive a lot of traffic to your website. This kind of content is essential in your golf course's marketing strategy as it will increase social media interaction, search traffic, and brand awareness (all things that can help gain you more traffic from search engines). Your golfers will definitely be looking for ways to improve their game. Helpful videos and articles are quality content that will keep people coming back. Most golf courses post about upcoming deals or a recap of a recent tournament, but you can also add a bunch of interesting, original content for people to consume. More people will like, share and comment on your posts, so ultimately Google will rank your page higher than your competitors. If your golf operation is in a very competitive space and you are still struggling to rank online you may need find outside help. There are many media agencies that are experts in SEO and know how to optimize your website exactly to Google's standards. This usually requires a significant investment but the ROI can be substantial if your course is operating in a competitive area where online search is a popular method of booking tee times. Golf courses that rely heavily on tourism in areas like Hawaii or Mexico serve as examples of operations that must invest heavily in SEO to attract online golf reservations. If your golf course doesn't have the means to hire contractors to support these initiatives, there are many resources online that can help educate you on SEO and Golf Marketing Strategies. Check out www.neilpatel.com for a ton of advice on improving SEO and driving more traffic to your website.